This new smartphone friendly experience will help users to be able to bring their brochures to life. 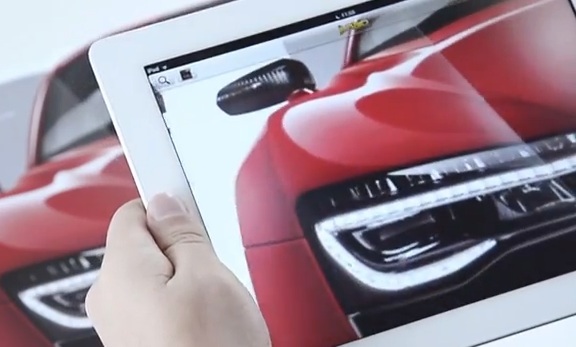 Audi has just announced the unveiling of its Audi Vision augmented reality platform for mobile devices, which will give consumers the ability to use their smartphones and tablets to bring the brochures to life. The Audi Vision platform will be simple and straightforward to use for smartphone and tablet owners. It is designed to allow the user to simply point the device at one of the vehicle manufacturer’s spring price and specification guides for 2013, and take a “picture” that will transform the printed pages of the brochure into a full augmented reality experience that includes additional pictures, video, and even more content. The company hopes that the augmented reality experience will reflect the innovation of the brand. When the Audi Vision augmented reality grabs onto any specific brochure that is used, it will not need a data connection after that point. This could make a considerable difference in the convenience and experience provided by the application for the consumer.